The Hairy Hound was completely remodeled in 2013 with top quality grooming equipment, hydro-bathing systems and new pet friendly holding areas. Whether your furry friend needs a basic wash and trim, or a complete makeover, our certified groomers are here to pamper your pooch! We use state of the art equipment that caters to all dog breeds in our safe and clean environment. Our grooming staff is dedicated to providing the professional care and loving attention your pets deserve. Pets get to know our groomers because we take it slow, handling every pet individually and with great detail. Use to have my 2 dogs groomed here 2 years ago before I moved away. When I was going it was a wonderful place the dogs are well cared for and everyone working there seem to be wonderful at there jobs! They were always friendly and always wonderful with the puppies!! Great local business! I have a spaniel mix and a pointer mix and the women did a wonderful job. Both of my furry babies can be temperamental and fidgety. I will definitely be back. They are affordable, local, friendly to both humans and canines alike. I love the booking online section of their website! Took both my canines in for a thorough grooming. It was a stress-free trip for both canines (one of which had never been to a professional groomer before), and for myself as well. The shop is on the small side, which I like! The staff are personable and both the dogs liked them straight away, which is a minor miracle already. 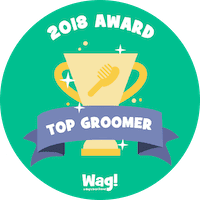 I’ve never used a groomer on a regular basis, but for the reasonable prices and the thorough grooming job, I will definitely be returning with my canines in the near future. I love the Hairy Hound. They are always very friendly and they make it easy to make an appointment. My dog comes out all happy and beautiful every time. I would recommend them to anyone. The Hairy Hound Pet Groomer services are awesome. Our little dog had a previous bad experience at another local groomer. Right after the new store opening I called Ruth at the Hairy Hound and she assured me she would take the time to help our dog relax before she attempted any grooming. She said she would never force our dog and if needed she would let the dog come back another day and try again. Everything went fine and we have been going to the Hairy Hound and getting the best care. The prices are reasonable and the service and results awesome. You won’t go wrong if you pick the Hairy Hound, tell them Foxy sent you.